Termites in warmer climates can often be a nuisance all year round, but colder weather could mean even more termites. Termite season is usually in cold temperatures in the fall or winter because termites, like all insects, are cold-blooded: below temperatures of 25 degrees Fahrenheit, a termite can die within just a few minutes. Because of this, as temperatures drop below 50 degrees, termites will begin searching for the warmer areas, such as burrowing underground (some as many as three feet underground), finding dead tree stumps to hibernate in, or– alternately– inside your building. Unfortunately, the basements often approach the optimal temperature for termites, and so if there are any that are nearby, they will attempt to inhabit and ultimately infest the home or business where they have taken up residence. Because of Phoenix’s unique climate, termite control in Phoenix is trickier than often assumed. Termites are in an optimal position to breed: the temperature gets cold enough to spur biological drives in termites to turn towards human habitations but rarely gets cold enough to kill them. This means that termites can become a recurring problem for local residents. A Phoenix termite control company with the right experience in the field understands the difficulty of eradicating termites from a home or business and knows how to ensure they do nott come back. Local termite control experts know what they are dealing with and are skilled at finding the entryways termites create to make their way into your building. Using the latest methods, they not can only destroy existing populations of termites but make can help home and business owners understand how to get rid of termites permanently, and with annual inspections, make sure that they do not come back. Phoenix homeowners and landlords who need help getting rid of termites can solve their problems by finding professional, experienced termite exterminators in Phoenix. Because Phoenix is unique, how termites do their work locally is also very unique– get in touch with experts who will solve your problem before it becomes expensive, potentially dangerous, and a headache for your insurance company later. 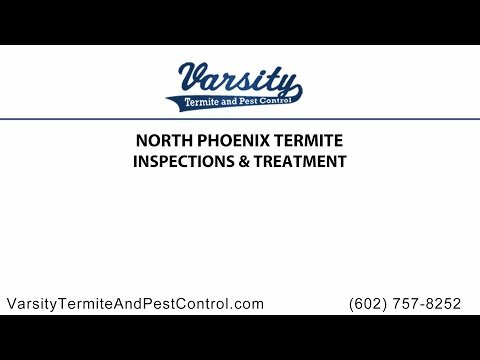 Contact Varsity Termite and Pest Control today for more information or any question and concerns regarding termites. Winter Pests: Where Do They Go? Read the rest of Winter Pests: Where Do They Go? Can Termites Survive through Arizona’s Intense Summer Temperatures? Read the rest of Can Termites Survive through Arizona’s Intense Summer Temperatures?